You may think Cheese Lumpia is easily cheese wrapped in eggroll and fried, right? Partly right, but not necessarily that easy if you don't know the technique. Cheese readily melts in hot oil and you will end up with cheese outside the wrapper and in the cooking oil, thus, a roll that is empty inside. One trick is to cut the wrapper the right size so they're not bulky where the outer part is crunchy but the inside is raw. Also, the lumpia has to go in and out of the hot oil in a minute or two just enough to turn the wrapper golden brown. The most important thing : freeze the lumpia before frying so the cheese will not rapidly melt in the hot oil during the 2 minutes of frying. 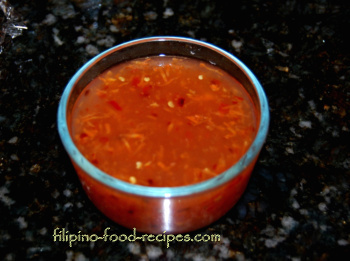 One recipe of Sweet Chili sauce. 1 Lay one cheese stick on the lower third part of a piece of eggroll wrapper (both cut in sizes as above). 2 Tuck the sides in then roll up one end to other end, sealing with a dab of water. 3 Repeat for all the other cheese sticks and wrappers, then freeze for at least one hour. 4 Deep fry to golden brown in hot oil for just 1-2 minutes. 5 Serve hot with sweet chili sauce. Quick-melt cheese is not advisable to use. It will easily melt in the oil even if you freeze it for days. 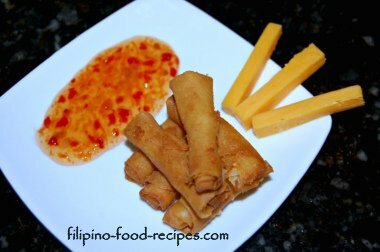 This lumpia can be said as a take on the mozarella sticks appetizer, which is dredged in seasoned flour, fried and served with a marinara dipping sauce. Make sure the eggroll wrapper is not too wet when you seal with water, or they will stick together once you put them in the freezer. Try adding a thin strip of jalapeno pepper inside for a nice surprise to make it spicy hot. Do not cook for over 3 minutes or the cheese will ooze out and you will end up with hollow lumpia.